Note: Unravel Me is the second book in a trilogy. The following summary and review may contain spoilers for the first book, Shatter Me. Shatter Me was a striking debut, and I was very eager for this sequel. And Unravel Me surpassed my expectations, bringing back Tahereh Mafi's beautiful writing style and conveying a story that was emotional, full of revelations as well as action. Juliette knows the power she has, but she has never been comfortable with it. Unable to touch anyone without fear of killing them, she had lived in isolation for years until Adam came along. Now things have changed for her, yet although she lives with others, she still feels cut off from them. Her touch has the power to be a formidable weapon, but she may have abilities even beyond what she knows. However, discovering them means embracing a darker side of herself, one that she's tried to keep hidden. In the meantime, even though she is in love with Adam, Juliette keeps finding herself thinking about Warner. Juliette knows that sooner or later she will have to choose who she wants to be, how far she will go, committing herself to Adam or entertaining the possibility of Warner. But what choice is the right one? When I finished Unravel Me, all I could think is that there aren't enough words to describe this book. It took me a long time to compose any kind of coherent thoughts on the book, and it isn't often that I read something that leaves me so speechless. If you can think of good adjectives or adverbs, chances are that they can describe Unravel Me. Just like in Shatter Me, the writing is beautiful, the characters are complex, and the story is compelling. I was amazed by all the emotions that Juliette was able to give voice to throughout the story. More than once I found myself reading something and having to pause to reread and absorb the words on the page because a feeling had been captured in writing so perfectly. This book has so much emotional depth, but it is also setting the stage for what is sure to come in the third book. And yet there is still action here, more exploration of the gifts people at Omega Point have. It was interesting and sometimes surprising to see how all of these talents could work together. Throughout Unravel Me, Juliette really begins to take control of and embrace her power. She becomes stronger, not only physically but also emotionally, as she realizes that she can define herself and that her life has value beyond her desired use as an indestructible weapon. Even though at times she makes choices out of fear, she also learns to face these fears. Then there are Adam and Warner. Throughout the book, I just wanted to hug them both. I love both of them, but for different reasons. With such well-written characters, it would be impossible not to love them, or at least be intrigued by them and touched by their actions and their feelings for Juliette. (I also realized that reading Destroy Me is a necessity, not just an option. Not because it's needed to understand the story, but because it's more Warner.) Kenji and James also make appearances, Kenji providing humor and James being the sweet kid that he always was, and I enjoyed seeing both of them again. Every element of this book worked together to create something truly incredible. There are so many moments in this book that just have to be experienced. 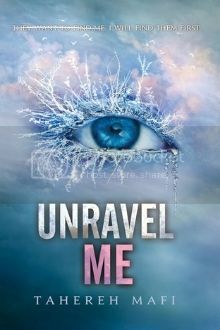 If you haven't read Shatter Me, move it to the top of your reading list, and if you haven't picked up Unravel Me yet, what are you waiting for? The beautiful writing alone makes these dystopian novels stand out from all the others in the market. I absolutely cannot wait for the third book in this trilogy!